Why did you choose an EV? Suzanne: I am a physician anesthesiologist, and every year I listen to my patients complain about breathing problems and worsening asthma due to our serious air pollution. Breathing polluted air is a serious risk to Utahns’ health. The medical evidence is overwhelming: even short-term exposure to air pollution harms our health. Air pollution increases the risk of heart attacks, strokes and cancer, and it contributes to shorter lifespans. Vehicle emissions account for roughly 50 percent of local air pollution, so driving an electric vehicle was something our family could do to reduce air pollution in our local airshed. We want to be a part of the solution, and we hope everyone will find ways to improve our air quality whether that is by carpooling, avoiding idling your car, taking public transportation, or voting for elected officials who are willing to tackle this issue. It is time for each of us to do our part to improve the quality of the air we breathe, and driving a zero-emission vehicle is definitely a great way to start. How expensive was it to make the switch? Suzanne: Our family has always wanted to do our part to better the environment. But we thought we could only make an impact years down the road after we had tens of thousands of dollars saved up. We first realized this wasn’t the case when we were in the market for another car. We weren’t looking for an EV at first because we assumed they were too expensive, but my husband was browsing KSL Classifieds [a local classified service] and came upon a used Nissan Leaf with less than 10,000 miles for only $10,000. We couldn’t believe what a bargain used ones were going for! Is it a practical car? Suzanne: Our EV has quickly become our favorite car for commuting and running errands around town. Electric vehicles are quiet, require less maintenance, have lower fuel costs, and don’t rely on petroleum. Charging our car at home is more convenient now that we have an EV charger right in our garage too. Why did you choose to have both solar and an EV charger installed at your home? Suzanne: Our daughter’s fifth grade science fair project on solar panels initially got us pretty excited about researching options. Then we were talking to a good friend of ours who shared how we could pay for solar panels over time with an affordable monthly payment. He also mentioned that we could bundle a rooftop solar energy system with an EV charging station for no money down. It just made logical and financial sense to us. We can now generate our own energy and charge our EV at a much faster rate for the next 10 years. While every family’s financial situation is different, we were surprised by how attainable these products were for everyday homeowners. 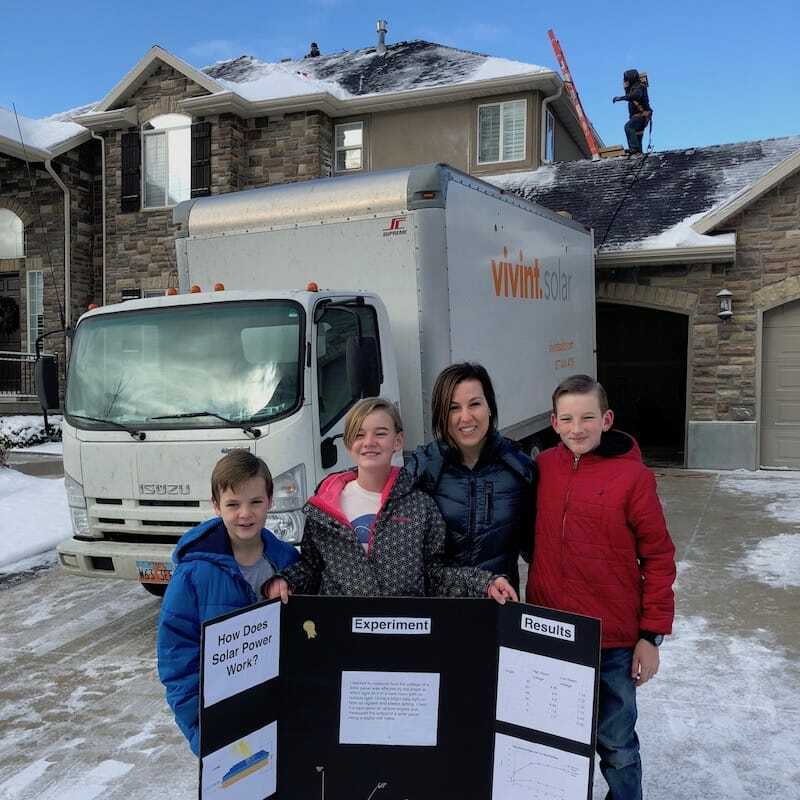 Suzanne Harrison with her two sons and daughter, Ellie, who did a science fair project on solar power. Why solar? Has it been worth it? Suzanne: It has been a great option for us! There are many reasons to go solar but the best part is the predictability and control we now have over our energy costs. Even in winter, we will be paying less per month for electricity. In fact, the combined cost of our monthly solar loan payment is less than what we previously paid for electricity. We can send the excess energy we generate to Rocky Mountain Power for a credit on our utility bill, and our compensation rate is locked in until 2032. Getting solar panels has been an an easy and affordable way for us to contribute to a sustainable future. What about when it’s not sunny? Suzanne: UV rays are still streaming down even on a cloudy day or during an inversion, and our solar panels are still effectively absorbing and converting energy into power for our home. We may see a slight decrease during cloudy periods, but overall they still work and will be producing energy. Bottom line: would you recommend rooftop solar or owning an EV to your friends? Suzanne: Definitely. Transitioning to clean energy has been an illuminating experience for me. I’ve realized many of the assumptions I had about this process were quite off the mark. It has been a much simpler – and more affordable – step for our family than we expected. For anyone on the fence about going solar or driving an electric vehicle (or both! ), I would highly recommend it. To find out more about solar and electric vehicle chargers, call us today.